Roof damage can happen as a result of any number of incidents, and it can come in many forms. In winter, the weather can be a significant factor; snow, ice, and wind all create forces that are hard on your roof. Ice dams, for example, is a roof’s enemy. It poses a threat to your roof and attic that could leave you in need of expensive repairs. You might need new insulation, new roofing, water damage restoration, and more. 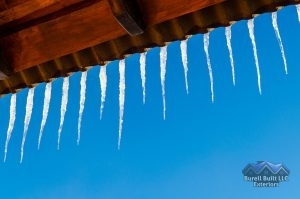 Avoid Ice Dams on Your Roof . Ice dams are build-ups of ice at your roof’s edge. They are caused by temperature fluctuations on your roof; when the roof is too warm, it melts whatever snow or ice is on it. That water then runs down to the edge where it’s cold, and freezes. You know those pretty icicles? They can sometimes be signs that you have an ice dam. It creates a dam that prevents water from running off your roof the way it should. That water goes where it can–into your roof, attic, and home. This means that you have moisture in the wrong places. That moisture can cause all sorts of problems, like roof rot, mold, mildew, and more. Your roof and attic insulation could be ruined. The repairs for these problems can get expensive, too. It’s necessary to take steps to prevent this issue if you expect ice or snow in the winter. Make sure you have good roof and attic insulation. These two things prevent the heat in your home from rising too far up and warming the roof. So, not only can you prevent the ice dams, but you can keep that heat where you want it and stay comfortable when it’s cold. Have a professional come out and inspect your attic and roof insulation, and avoid ice dams on your roof this winter. When you need roofing services, just call us at (865) 385-6926 for roofers in Knoxville, TN. Posted in Uncategorized and tagged ice dams on December 19, 2017 at 4:50 pm by Burell Built Exteriors.